Initially Holy Prophet Muhammad (pbuh) met the believers secretly in al-Arqam's house. 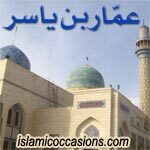 He wanted to keep his religion Islam a secret so that Abu Jahl, Abu Sufyan and other polytheists would not hurt the Muslims or followers of Islam. 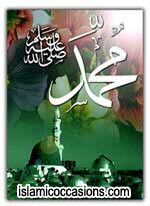 Suhaib answered: I have come to hear Holy Prophet Muhammad's (pbuh) words. And what are you doing? I have come to hear his words, too. Then Ammar ibn Yasir and Suhaib came into al-Arqam's house. They humbly began listening to Allah's words and to the Verses of the Noble Qur'an. Ammar ibn Yasir's heart was full of belief as streams are full of rain water. When Ammar ibn Yasir and Suhaib wanted to leave al-Arqam's house, Holy Prophet Muhammad (pbuh) said to them: Stay here till evening. Holy Prophet Muhammad (pbuh) was afraid that Quraish would hurt them. Ammar ibn Yasir waited until it got dark. Then he left al-Arqam's house and hurried towards his house. His father Yasir ibn Amir and mother Sumayyah bint Khabbab were waiting for him anxiously. When Ammar ibn Yasir entered, the little house was full of happiness. He began telling his parents about Islam, Allah's religion. Abu Jahl heard that Ammar ibn Yasir became a Muslim. So, he got crazy. Abu Jahl led a group of polytheists and went to Yasir's house. Torches were in their hands. They burnt the house and took Ammar ibn Yasir, Yasir ibn Amir and Sumayyah bint Khabbab to a desert outside Makkah. They chained and began torturing them. First, they whipped them till blood flowed out. Then they brought torches and began burning their bodies. But that small family went on their firm belief in Islam. Abu Jahl brought rocks and put them on their chests. They were breathing hard. Still they were believers. It was noon, the heat was intense. Abu Jahl and the polytheists came back to Makkah. They left Yasir's family in the intense heat of the sun. In the meantime, Holy Prophet Muhammad (pbuh) passed by the family. When he saw them he wept and said: Yasir's family, be patient! Your reward will be Paradise! Sumayyah bint Khabbab said with belief: I confess that you are Allah's Prophet. And your promise is true. Ammar ibn Yasir saw what happened to his parents and wept. Then Abu Jahl shouted angrily at him: If you don't praise our gods, I will kill you too! Ammar ibn Yasir went weeping to Holy Prophet Muhammad (pbuh). He was not weeping for his parents or for himself or for the torture he had suffered - he wept because he praised the polytheists' idols. Holy Prophet Muhammad (pbuh) consoled Ammar ibn Yasir on his parent's martyrdom. Ammar ibn Yasir went on weeping. Then he said: Allah's Prophet, the polytheists did not release me until they forced me to praise their gods! Ammar ibn Yasir answered: Allah's Prophet, my heart's certain of faith. Holy Prophet Muhammad (pbuh) said, don't worry! Allah sent down a verse concerning you: "Not, he who is compelled while his heart is at rest because of his faith." With enthusiasm, the Muslims or Sahaba (Companions of Holy Prophet Muhammad (pbuh)) began building the Holy Prophet Muhammad's (pbuh) Mosque in Yathrib (Madina al-Munawara). To encourage his Muslim brothers, Ammar ibn Yasir repeated the following enthusiastic words: Those who build the mosque do not equal those who avoid dust. Days and months passed. Allah, the Glorified, wanted to punish those who persecuted the Muslims in Makkah and robbed them of their belongings and money. The Muslims heard that the polytheists had formed an army. 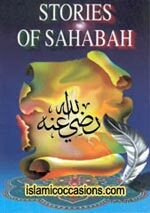 Abu Jahl headed the army and he was heading for Yathrib (Madina al-Munawara). Holy Prophet Muhammad (pbuh) asked the advice of his Sahaba (Companions of Holy Prophet Muhammad (pbuh)). Finally, he took a decision to face the polytheists. Holy Prophet Muhammad (pbuh) sent Hazrat Ammar ibn Yasir (Radiyallahu Anhu) and Hazrat Abdullah ibn Mas'ud (Radiyallahu Anhu) to get him information about the polytheists' army. Ammar ibn Yasir was brave. He approached the polytheist's caravans and went round their camp to collect information. Hazrat Ammar ibn Yasir (Radiyallahu Anhu) and Hazrat Abdullah ibn Mas'ud (Radiyallahu Anhu) came back to Holy Prophet Muhammad (pbuh) and informed about their low spirits. In the morning, when the polytheists woke, they found strange footprints. Munbih bin al-Hajjaj had a good knowledge of footprints, said: By al-Lat and al-Uzza (idols), these are Ammar ibn Yasir's and Abdullah ibn Mas'ud's footprints. On the morning of 17th Ramadan, 2 AH, the great Battle of Badr, the first battle in the history of Islam, took place. In this battle of Badr, Allah granted the believers victory over the polytheists. Many traditions are narrated from the Holy Prophet Muhammad (pbuh) about Hazrat Ammar ibn Yasir (Radiyallahu Anhu) regarding his virtues, outstanding traits and his glorious deeds, such as the tradition which Hazrat Ayesha and other have narrated that the Holy Prophet Muhammad (pbuh) himself had said that: "Ammar was filled with faith from the crown of his head to the soles of his feet." In another tradition the Holy Prophet Muhammad (pbuh) said about Hazrat Ammar ibn Yasir (Radiyallahu Anhu): "Ammar is with the truth and the truth is with Ammar. He turns wherever the truth turns. Ammar is as near to me as an eye is near to the nose. Alas! A rebellious group will kill him."